In celebration of their upcoming World of Warcraft and StarCraft II lines, Mega Bloks is hitting BlizzCon 2011 big time, with a tiny Thrall for every convention attendee, a limited edition StarCraft II Battlecruiser, and much, much more. I've become a bit of a Mega Bloks fan ever since I picked up one of their Need for Speed vehicles back in August, so I'm pretty jazzed that the company is taking a shot at some of Blizzard's top properties. They seemed pretty thrilled as well, pulling out all the stops for a titanic showing at BlizzCon 2011 this weekend. 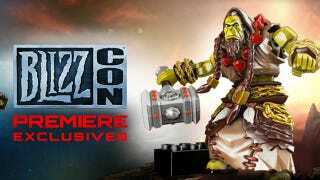 Things start off small with a special present for all physical attendees to the show, a special edition figure of World of Warcraft's top orc, Thrall. Everyone at the show will score one, and there will be ‘Make & Take' stations on the show floor where attendees can try to build their own display stand for the fig. From there Thrall gets much bigger. Standing seven feet tall and weighing in at more than 1,000 pounds, Mega Bloks Thrall is the biggest Mega Bloks statue ever built. Con-goers are invited to take their picture with the massive creation and Tweet it for a chance to win signed concept sketches of the mini-Thrall giveaway figure. They've even got a custom, one-of-a-kind Mega Bloks replica of the famous evil sword Frostmourne on display, which the attendee closest to guessing the number of pieces in its construction will go home with. Along with all of that World of Warcraft goodness Mega Bloks will also be debuting their WoW product line at the show, giving fans a sneak peek at what's in store for them next summer. And what of StarCraft II fans? Show attendees and virtual ticket buyers alike will be able to purchase the 1,700-piece limited edition StarCraft II Battlecruiser. With only 3,000 of these gorgeous piece produced, this is one priceless set (translation: I don't know the price yet). And hey, I'll be there too, trying to talk the Mega Bloks designers into letting me walk off with Frostmourne. I'll just pour on the old Fahey sweat charm. Hit up the link below for a glimpse at the mighty sword, the mighty Thrall, and the mighty other things I'll be checking out in Anaheim this Friday.